There are a ton of nutrition bars available today. There are energy bars, protein bars, low-carb bars, meal replacement bars, snack bars, et cetera. 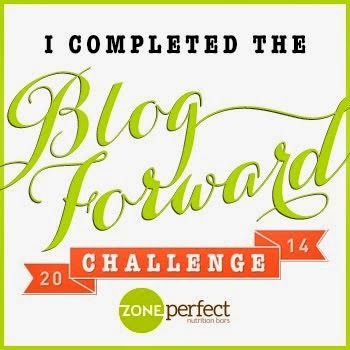 In fact, not that long ago, I reviewed a snack bar, the Zone Perfect All-Natural Nutrition Bars. And I really do enjoy Zone Bars (as well as several other kinds of nutrition bars) and eat them fairly frequently, but they're not my bar of choice when it comes to pre-race or pre-workout fueling. When it comes to eating before hard efforts, I've tried a lot of energy bars, and I keep coming back to one: the PowerBar Performance Energy. While Powerbar actually offers a wide variety of sports nutrition products, when people think "PowerBar," the Performance Energy is most likely the bar that comes to mind. This is the old-school PowerBar that we've all come to know and love. I'm not sure how much the nutrition facts and ingredient list have changed since their introduction in 1986 (though I'm fairly sure they've gotten better tasting since I began eating them in '99...either that or my tastes changed a whole lot), but this was the original sports energy bar. Kickin' it old school! Anyone remember this logo? PowerBar Performance Energy bar is a great choice for use before & during higher intensity competitions or training sessions like running, cycling & swimming. It’s formulated with PowerBar® C2MAX dual source energy blend, a 2:1 glucose to fructose blend found to deliver 20–50% more energy to muscles than glucose alone and improve endurance performance by 8%. * Performance Energy bars contain 200mg sodium — a key electrolyte lost in sweat that is associated with muscle cramping in some athletes. Fueling up right can make a big impact on how you feel and perform, no matter what you’re tackling. Eat 1 bar 30–60 minutes before exercise, and for events lasting over 1 hour, eat 1–2 bars per hour during exercise. *Currell K, Jeukendrup A. Superior Endurance Performance with Ingestion of Multiple Transportable Carbohydrates. Med Sci Sports Exerc 2008; 40: 275–281. Taste-wise, it's definitely a PowerBar. Don't expect a chocolate PowerBar to taste like a chocolate bar. Instead, it'll taste like "energy bar chocolate," and anyone who's had "energy bar chocolate" knows exactly what taste I'm talking about. No matter what flavor you get, it's still going to taste distinctively "PowerBar." Cookies & Cream is my favorite, and Vanilla Crisp tastes pretty much the same to me, despite lacking the cookie pieces that I don't taste anyway, so obviously I'm a fan of Vanilla Crisp too. Peanut Butter and Chocolate Peanut Butter are also good, though I don't get a lot of peanut-y flavor in the latter. Milk Chocolate Brownie tastes very similar to the regular Chocolate to me, and I'm not sure I could tell you the difference in a blind taste test. Apple Cinnamon doesn't taste particularly like apples (it has that fake apple flavor that I associate with apple cereal), but isn't bad. Those are all the flavors I've eaten recently, so beyond that, you're on your own. Unlike many other nutrition bars on the market today, the PowerBar Performance Energy's texture is completely homogeneous. No oats or nuts or granola here (though the Cookies & Cream one does have little cookie bits...sadly the store did not have them when I bought this one to take pictures). It's all one texture: stickier, chewier, and less likely to keep its shape than a Larabar, but much more solid than a Gu (or any other gel on the market). 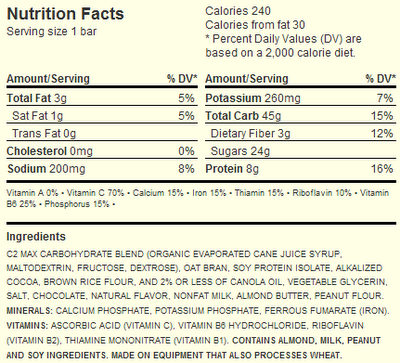 As far as nutrition goes, PowerBar does a great job with this, as long as you're using it as a sports energy bar. Lots of easily-digestible carbs (2:1 glucose to fructose), ideal carbohydrate to protein ratio, low-fat, low-fiber, high-sugar, electrolytes...basically everything you want for pre-workout (though probably not something you want to just make a random snack, unless for some reason you really love PowerBars are dessert...and I'm guilty as charged). Easily digestible carbs and sugars mean fast energy, low-fiber and low-fat speeds gastric emptying, and the electrolytes replace those lost through sweat. There is definitely a reason I make this my go-to bar for pre-race nutrition. The ingredient list is harmless enough...nothing out of the ordinary, though if you have allergies, you definitely should note that there are quite a few potential allergens in there. One thing to note is that PowerBar Performance Energy bars really aren't something that you want to stash in the pocket of your ski jacket, since they'll freeze and become impossible to eat. Similarly, you probably don't want to take them on Badwater training, since they get extremely sticky and make a mess in hot weather. Then again, they're something you probably want to eat before you work out, since, well, maybe you can eat energy bars while working out, but while running, I generally prefer to stick to sports drinks and Gu, because that's about all I can handle without choking on my food (although I do bring energy bars snowboarding...but it's usually a PowerBar Harvest or Clif Bar, so it won't freeze). PowerBar Performance Energy is the perfect food for fueling prior to a hard workout or race. It's not something I'd recommend the average person just eat as a random snack (although I'd be lying if I said I didn't do that), because it is pretty much just a sugar shot, but for the athlete who wants fuel, you'll be hard pressed to do much better. Yes, I'm sure you can put together something with a similar nutritional profile and "more natural" ingredients for less money, but it'll be tough to beat the convenience of ripping open a PowerBar on the way to your race. As I stated before, there's a reason these are a mainstay in my pre-race breakfast. PowerBar Performance Energy bars retail for $18.99 for a box of 12 on the PowerBar website, though I can usually find single bars for less than that (usually $1.25-1.50) at many sports stores and grocery stores. 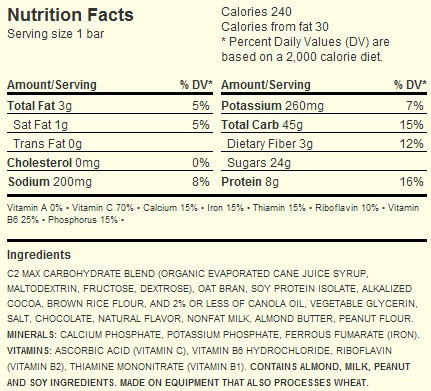 There is also a PowerBar Fruit Smoothie Energy bar available that looks very similar nutrition-wise and that I've also used before races and workouts...I believe it's pretty much the same bar in fruit flavors. Full Disclosure: Nothing to disclose, as I buy these myself. The opinions expressed in this review are mine and based on my experience, and do not reflect the opinions of PowerBar or anyone else.